Living on Mount Olympus just got a whole lot more active. That’s because—thanks to a partnership between the divisions of Business, Finance and Administrative Services and Enrollment and the Student Experience—the Graham Fitness Center opened today on Mount Olympus. Auxiliary Services and Recreation Services, with help from Campus Planning, Design and Construction, converted space at Flint and Day halls into a new fitness center. Based on student interest in expanding options, the teams identified the space as a way to increase access to health and recreation services. 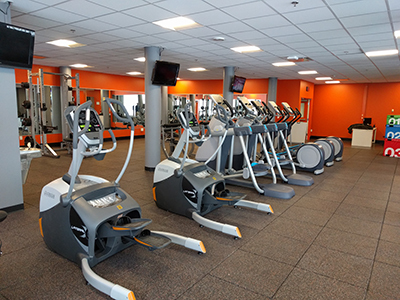 Auxiliary Services provided the funding support for the infrastructure needs, and the Invest Syracuse initiative funded the fitness equipment to enhance the student experience by expanding access to health and wellness services. While the transformation of Archbold Gymnasium progresses, this new fitness center provides additional opportunities, especially for Flint and Day residents, to incorporate health and wellness into their regular routine. “This new recreational facility is another valuable asset to the University community while Archbold is under construction, and will certainly make it more convenient for students on the Mount to access a recreational facility. Thank you to all those who made this a reality, and we hope students enjoy and utilize the new option,” says James Franco ’18, Student Association president. Saturday and Sunday, 10 a.m. to 11 p.m.
For more information on Recreation Services facilities, hours and offerings, check the Recreation Services website. Invest Syracuse: Advancing Academic Excellence and the Student Experience aims to provide all students with a distinctive, world-class learning experience that prepares them for professional and personal success. The three-pronged initiative seeks to redefine the student experience, advance discovery and innovation, and expand opportunity for students of promise and talent from across the socioeconomic spectrum. To learn more about Invest Syracuse, visit http://investsyracuse.syr.edu.